Now that? That is ***BLING***!! Interesting. So these old white dwarves eventually solidify/crystallise. But then what happens to them afterwards? The origins of religious fundamentalism appear to be brain lesions. "... although more massive white dwarfs go through the process sooner. This means that billions of white dwarfs in our galaxy have already completed the process and are essentially crystal spheres in the sky. 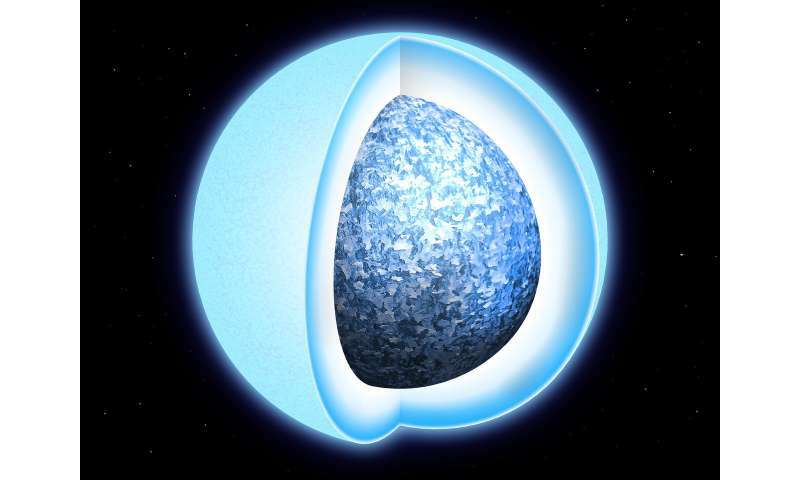 The Sun itself will become a crystal white dwarf in about 10 billion years." In about 4 billion years, the Sun will be a red giant. After that, it will blow off its outer layers and become a white dwarf. In about another 6 billion years, it will cool off enough to crystallize like this. Does that get it across? Sorry I don't care enough to make rhymes. I'll stick with prose. Da Schneib> In about 4 billion years, the Sun will be a red giant. Marvellous to see the datasets from Gaia being used as the basis of so much new work in astronomy and astrophysics. And there's so much more to come! I was wondering at first what rôle electron degeneracy might play in the crystallization process. And then I realized it would be none at all: the crystallization would occur between the ions in the WD's body, and the electron degeneracy would remain untouched by the process. Yeah, you know that when they go for poetry they are really desperate for attention (but gets less since it is even more incomprehensible chatter). Dense dunces, indeed; but it acts like the gravel on a road, you step on it and you don't even notice after a while. It is when others comment on it that I see it nowadays. uhh, granny, perhaps I am misunderstanding? That the galaxies only exist while the stars are shining? Cause my understanding is there will eventually be a whole lot of cold, dead "Dark Galaxies" consisting of these dead cold dead crystallizing stars. All held together by their mutual gravity. Temporarily over a span of a trillion years or so. Locally maybe within a few hundred billion parsecs radius. Long after the expanding Universe separates the gravitational-bound clusters of Galaxies beyond the light-speed boundary. "This will push the carbon upwards, and that separation will release gravitational energy." Okay, I can see that energy will be released when the heavier solid oxygen sinks, pushing up carbon, and the friction opposed to these motions will heat the surroundings. I presume this energy release is in addition to the latent heat energy release from only the conversion of liquid oxygen to solid. How long do they have to cool before they are no longer detectable?